Omega Mall Karachi is the recently launched high-class commercial project that is developed by Soneri Builders and Developers. Omega Mall is the largest commercial project of North Karachi that is offering business opportunities to the large extent. Omega Mall is a masterly planned project designed to furnish its activities person and customers with all required facilities under one roof. Omega Mall is an international shopping square with the elite characteristics that you always expect to have around you, as it is an ideal spot for the businesses like fashion brands, garments, shoes, electronics, boutiques, gift items, and many others. Omega Mall Airport is developed by Soneri Builders and Developers Limited a leading corporation having an expanded the range of construction project in Karachi. The developers have created Omega mall as an inspiration for international standards. They always try to provide and develop quality projects for individuals and families while raising self-sufficiency and community revitalization. The project is located in an ideal location of the city on Main Jinnah Avenue, Model Colony Road, opposite to Jinnah International Airport Karachi. 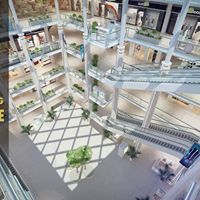 The mall is surrounded by the secure nearness of Miler Cantonment, and Jinnah Avenue, and thus it poses the great potential to be the best investment opportunity for you. Furthermore, Chase Departmental Store spread over 40,000 square feet area in Omega Mall and already function successfully. Additionally, specially designed food court, play area, bowling zone are constructed on 80,000 square feet area, and spacious parking space of this same size has been sanctioned for the visitors. Moreover, the mall is best suited for all kinds of businesses including electronics, jewelry, boutique, fashion brands outlets and beauty salons for bridals. The developers are providing a very convenient and comfortable payment plan by keeping in view the income level of people. The interested investor will be required to make a down payment of 10% of total amount and then 10% more after 30 days of booking. Then after 60 days of booking, he will be required to pay 10% more, and the balance amount will be payable in 36 monthly installments. Omega Mall Airport will install large generators to provide quick access to power in case of electricity shortage. 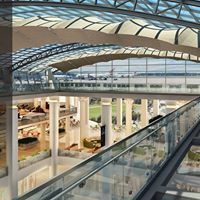 Omega Mall Airport will also provide a fully secure environment to its members as the whole project protected by Guards, and CCTV Coverage and security checkpoints are the plans to place at all entrances. Every Block of Omega Mall Airport will be equipped with an operating arrangement and separate entrance and exit to save from fire incident. Omega Mall will provide separate parking space for each single block to handle the vehicles and cars of visitors. The designers have provided high-speed capsules and cargo lifts caring about the ease of families the and also provided fast elevators to comfort the old and adolescents. The developers have provided the visitors a land where they won’t stop accruing as they have provided an excellent and expeditious gymnasium. At Gymnasium, they can kill their extra calories and get a healthy and fit life. The developers have also designed an entirely organized prayer room at the priority. The Prayer Hall is designed with the aim to serve the entire mall, and mall also holds an openly segregated prayer area for visitants and the customers. 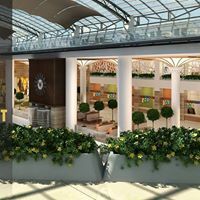 To give the customers a memorable and delicious shopping experience with the devoid of quality cuisine, the Omega Mall has also planned a food court with multiple food choices. From Chinese, fast food, junk food to desi food you will find the entire range here at food court area.